I've had souse and pumpkin fritters and rice and peas. I've had pancakes cooked in oil and sweet fresh passion fruit juice. I've had flying fish with Delish. I've had brown chicken stew and searched in the market for The S Bend hot sauce. All this thanks to Vida. And who did I just hear from? And who will I see next week? VIDA. I've spent weeks wishing I could go to our island and now someone from our island is coming to us. I'll fetch her and we'll cook for HER. I'm almost too excited for words. Perhaps I will make her an orange cake. All that stuff you have never eaten - I have never eaten either. Most of what you listed made my stomach turn. I lie. I have eaten rice pudding. A good rice pudding is very delicious. I am very happy about Vida. Vida looks gorgeous. Her smile stretches from you to Australia by the looks of it. She has the warmest smile I've ever seen. I must tink too much, too. Because I have a headache. Oh my! I have just raced to your shelves, and grabbed all of your holiday albums from the last 3 years, and madly flipped through them while exclaiming "ooo, look how little the boys were,and...look...bb doesn't have a prescription snorkelling mask...and...is that a young badger commenting in that box? How adorable is that?" Vita looks so wonderful, and that food tastes so good (virtually speaking). Must agree, Vida's smile is contagious and puts you in a good mood instantly. Souse has PIGSHEAD as an ingredient...did you know this??? Jealous of your trip - looks like it will be delightful. This reminds me of when I first stumbled upon your blog and systematically started reading the archives and hearing about your vacations. reading the S Bend Sauce comments link, it seems that's the post where Paola found you! Food is our link to the world. 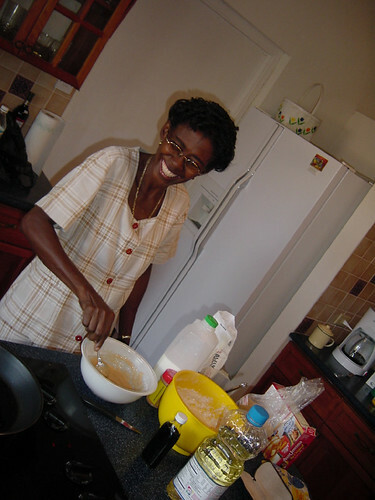 When someone cooks with smiles like that, everything they make will taste delicious. I'm just sure of it. My motto has been "Never trust a skinny cook"
But Vida seems to defy the model. I love that she is persnickity about her brands.